The round church of Santo Stefano Rotondo al Celio is fronted with an entrance portico added in the 12th century. The main body of the church is a reduced version of the original structure, which was built in the 5th century, probably the 460s. The current outer wall was initially a ring of free-standing columns on the same lines as the inner ring and you can still see the columns embedded in the wall from the inside. The ring was surrounded by a screen- and outer wall so that the total number of rings came up to four. The columns cutting across the inner diameter were added in the 12th century to support the roof and walls. The church has a wooden roof and is not domed. Santi Giovanni e Paolo was rebuilt after the Norman sack of 1084 and completed around 1150. The interior is in baroque style and was created in 1715-18, but the exterior was mostly untouched and was further restored in 1950-52. A domed chapel was added in 1851. The church has a bell tower, which rests on stone, which once supported an ancient temple and is decorated with ceramic tiles with Arabic inscriptions imported from Malaga. The current tiles are copies. The original church was built in the 4th century. Santa Maria in Trastevere was rebuilt in 1140 but the original church was probably built as early as the fourth century. The columns of the nave were taken from Roman ruins, probably the Baths of Caracalla. The portico in front of the facade was added by Carlo Fontana in 1702. New frescoes were added to the level of the windows and in the pediment in 1865-66 but these have all badly faded. The mosaic under the pediment and bell tower are both from the rebuilding in the 12th century. The brick facade bends outwards to prevent the figures in the mosaic from looking foreshortened. The facade of Santa Maria in Aracoeli was never completed. The church was consecrated in 1268, and plans to decorate the front were entertained for centuries until it was finally given up in the 19th century. Holes for scaffolding poles are still visible. The upper parts of the front curves outward to prevent the now lost frescoes from looking foreshortened. The arch above the main entrance also had a fresco added in 1465, the main window had a baroque frame with another fresco above, and the front has also been decorated with a medieval clock. The building incorporates some elements from a previous church stemming from the 8th century. The facade of the minor basilica of San Marco was added in 1465-70, to a renaissance design attributed to Alberti or Francesco del Borgo. The church was originally built around 833 and may have replaced a previous church dating all the way back to 336. The bell tower was added in 1154, while the interior is mostly from the 17th and 18th centuries. The extension of Palazzo Venezia in the 15th century is built around the church. The arches in the loggia were previously blocked off with windows inserted, and the Palazzetto Venezia (left) originally stood to the right of the church. 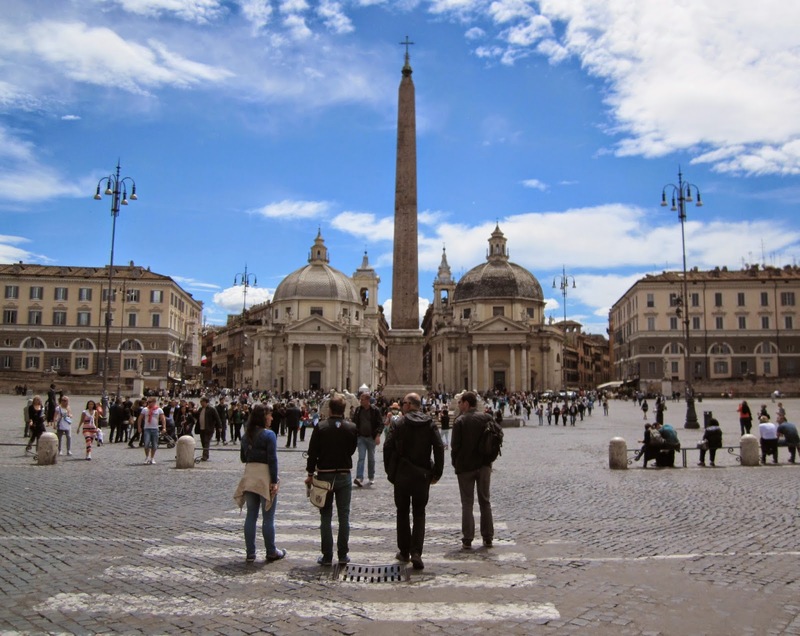 Santa Maria del Popolo was built in 1472-77 and replaced a previous church from 1235. The architects were probably Baccio Pontelli and Andrea Bregno. 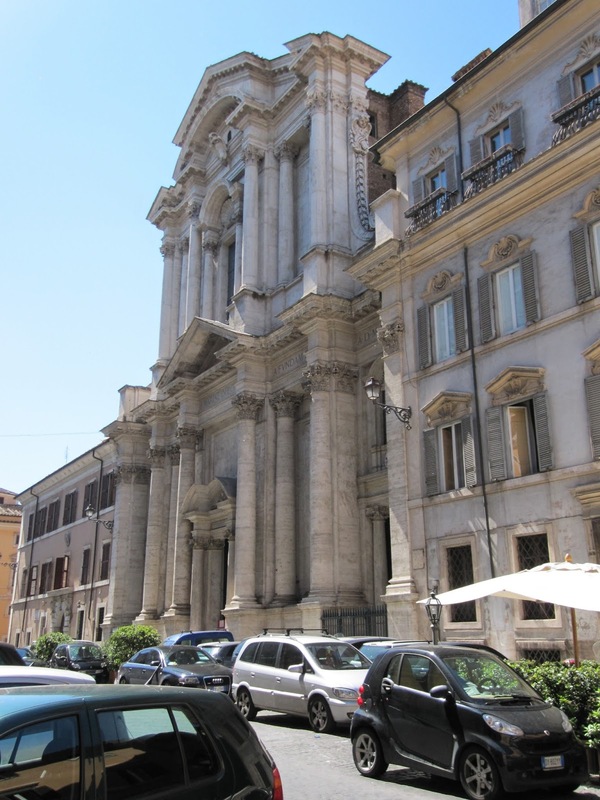 The facade was somewhat modified in 1655-60 by Bernini, but is still a good example of early Roman renaissance. The apse was extended by Bramante circa 1501. The church is hemmed in by buildings added in the early 19th century. Sant'Agostino was completed in 1484. The facade was completed by Giacomo di Pietrasanta and is supposed to be based on a design by Alberti. The stone is said to have been taken from the Colosseum. The new building incorporated a previous parish church known as San Trifone in Posterula, which was only demolished in the 18th century. The building of a new church started already in 1296 and was completed in 1446. It was subsequently rebuilt on a larger scale in 1479-84. 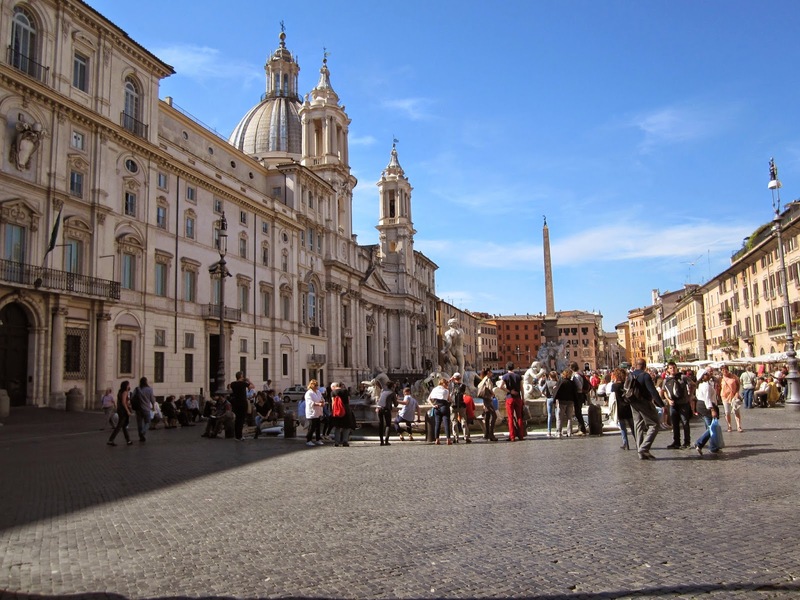 The church was reoriented to face Via Recta, an ancient road and main access route for pilgrims to the Vatican. 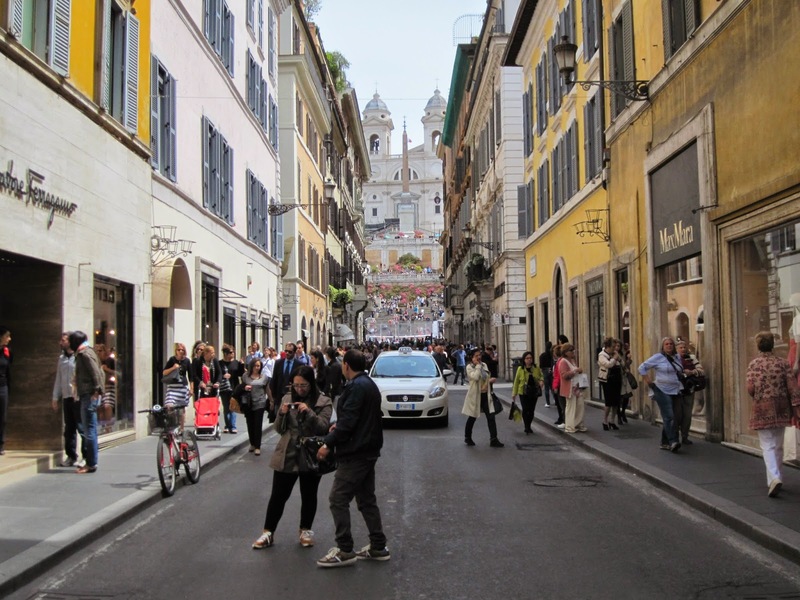 Traces of the old route still exist in Via delle Coppelle, Via S Agostino and Via dei Coronari. San Pietro in Montorio was built in 1481 to 1500 to designs by Baccio Pontelli and Meo del Caprina. The stairway was added in 1605. There had previously been a chapel from the 9th century and a convent from the 12th century on the site. A medieval tradition held that St. Peter was crucified on this spot but this claim has since been discarded. The church is famous for the presence of the Tempietto in the courtyard of the adjoining monastery. 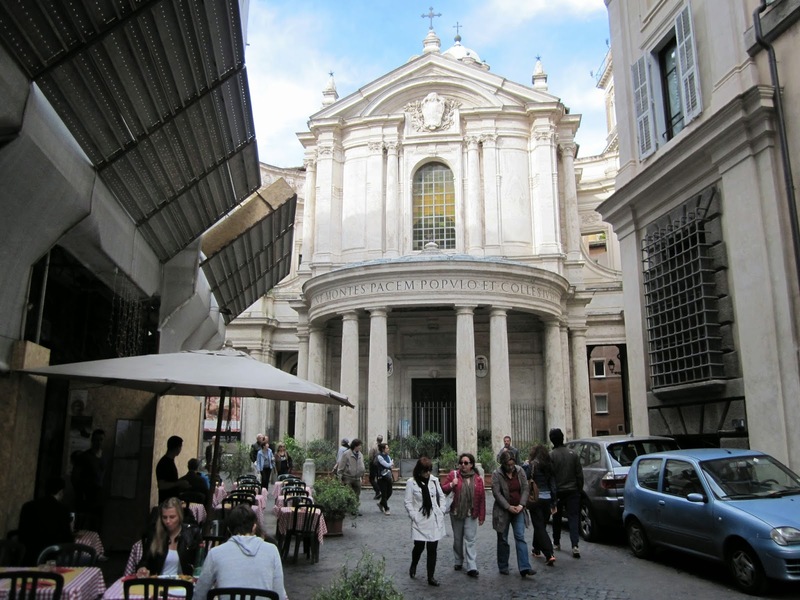 San Pietro in Vincoli was built in 432-40 and may have replaced an even older church. The old structure is largely intact despite successive restorations. The facade is a screen: the portico was built in 1475 and has been attributed to Baccio Pontelli. It was originally topped with a sloping tiled roof until the second storey was added in 1578. Il Gesù is the main church of the Society of Jesus. Construction started in 1568 to designs by Giacomo da Vignola but was altered after his death in 1573 by Giacomo della Porta. The church was finally consecrated in 1584. The interior was redecorated in the baroque style in the second half of the 17th century. 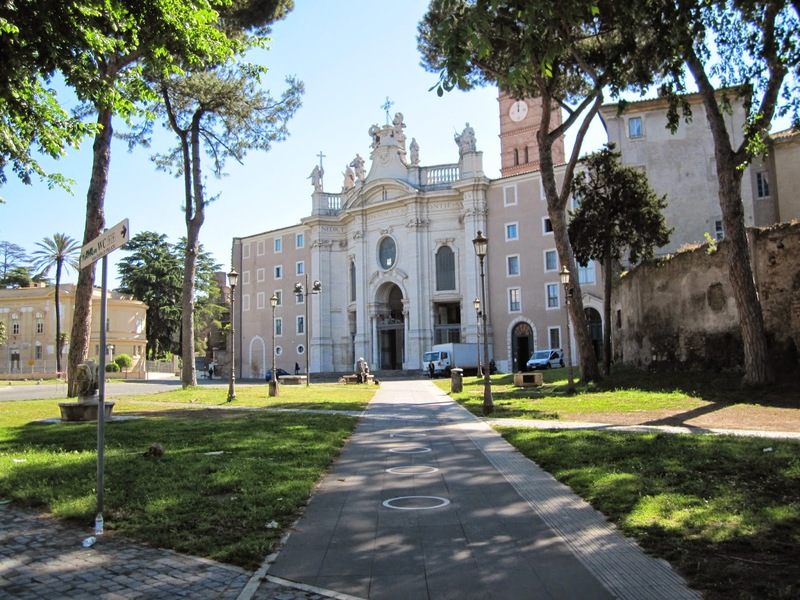 A previous church called Santa Maria della Strada stood just south of the present building. The first documentary evidence is from 1337 but the church could have been built earlier. Another church, dedicated to Sant'Andrea, was replaced with the Jesuit convent. Santa Maria ai Monti was completed in 1580 to designs by Giacomo della Porta. It has a similar facade and dome to Il Gesù, which also was designed by della Porta. Work on the church was completed by Carlo Lombardi and Flaminio Ponzio. 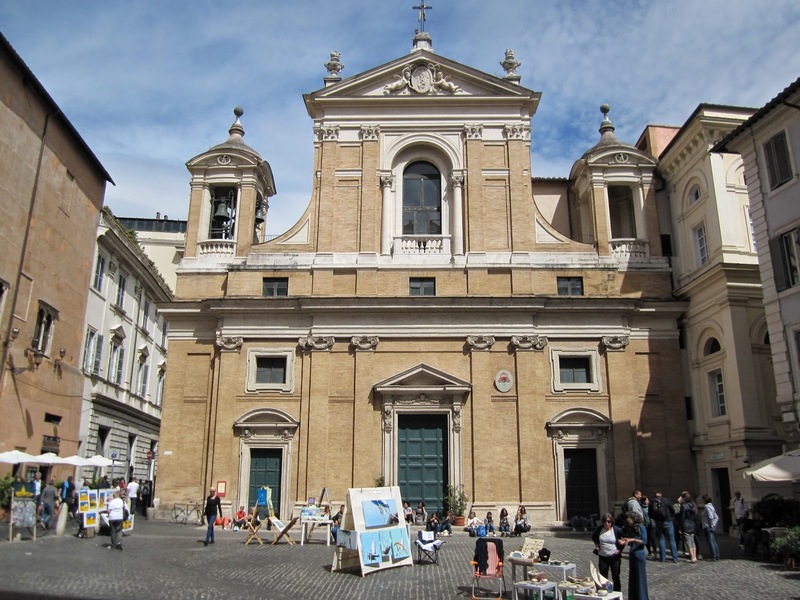 The church of the Santissima Trinità dei Monti has an unusual facade for Rome, possibly due to the fact that construction was originally begun in a French gothic style in 1502. It is not known exactly who is responsible for the final Italianate design but it has been suggested that the concept originated with Giacomo della Porta. The church was finally completed in 1585 and the double staircase (not the Spanish steps) was added by Domenico Fontana. The benediction loggia of San Giovanni in Laterano was designed by Domenico Fontana in 1586, though some modifications were later added by Guiseppe Valadier. Fontana also designed the facades of the adjacent Lateran Palace. 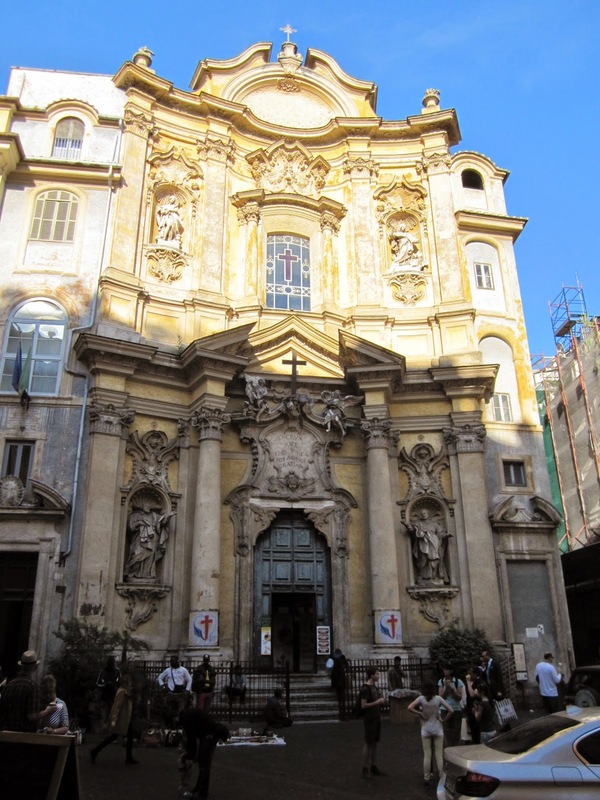 The national church of France was completed in 1589 with a facade most probably designed by Giacomo della Porta. The statues in the niches were added in 1746. Construction of a French national church began in 1518 and was initially intended as a round church designed by a French architect. This design was possibly inspired by the Tempietto but the project was abandoned after the sack of Rome in 1527. Santa Maria in Vallicella, more commonly known as Chiesa Nuova, was built in 1575-1606. It replaced a parish church, which may have been from as early as the late 6th century though the earliest source of the church's existence is from 1179. Several architects oversaw construction at various points, including Giovanni Matteo da Città di Castello, Giacomo della Porta and Martino Longhi the Elder. The façade was designed by Fausto Rughesi. The dome was finished by Pietro da Cortona in 1650. The bell tower was designed in 1666 by Camillo Arcucci. 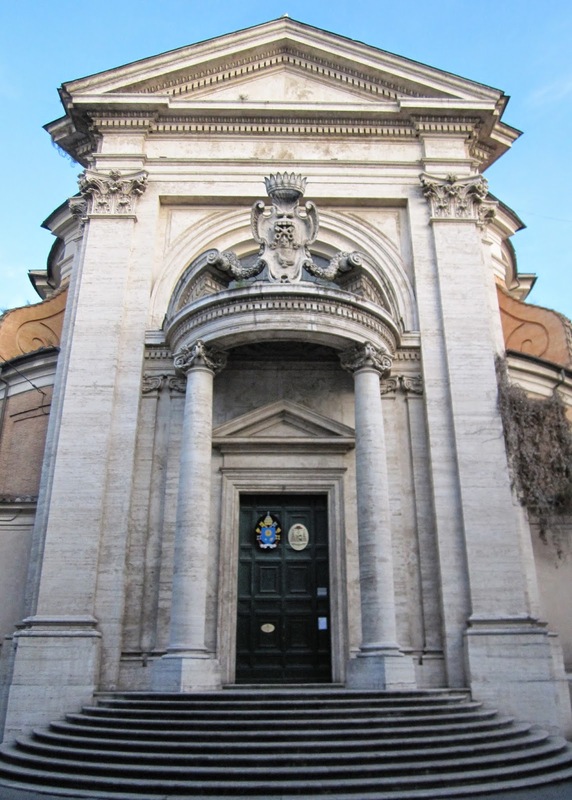 The adjoining Oratory was designed by Francesco Borromino and built in 1637-66. This was a rebuilding of a previous structure designed for the same purpose by Martino Longhi the Elder in 1572. The church of Santa Susanna was built in its present form in 1593-1603 to designs by Carlo Maderno. The first church on this site was probably built in the fourth century and was restored and embellished and then entirely rebuilt in the eighth. The Quirinal hill was subsequently abandoned and Santa Susanna was the only standing church to be left there. Nevertheless, the structure was rebuilt again some time in 1471-84. The church front of St Peter's Basilica was built in 1608-14. The architect Carlo Maderno had originally planned to include towers at either end of the facade but work was stopped in 1621 because the ground had subsided. Bernini made a second attempt in 1639 but this was also unsuccessful and the bell tower that was built had to be demolished in 1646. Clocks were installed in place of the towers by Giuseppe Valadier in 1790. San Bartolomeo all'Isola was built on the Tiber island in 998, by orders by the Holy Roman Emperor, on the foundations of an ancient temple. It was for a time the cathedral of the diocese of Santa Rufina. The church suffered repeated flooding and the bell tower is from a restoration campaign in 1118-80. Subsequent flood led to the abandonment of the church for 25 years in the 16th century. However, the church was restored again in 1583 and the facade was added in 1624, to a design by Martino Longhi the younger. Santa Maria della Vittoria was built in 1608-1626. The original architect was Carlo Maderno but the facade was designed by Giovanni Battista Soria. Most of the baroque interior is from the 18th century. The facade of Sant'Antonio dei Portoghesi was completed in 1638 and is generally attributed to Martino Longhi the younger. Some modifications were made by Cristoforo Schor in 1695. The church was rebuilt in 1624-38 and replaced a previous church from the 15th century. 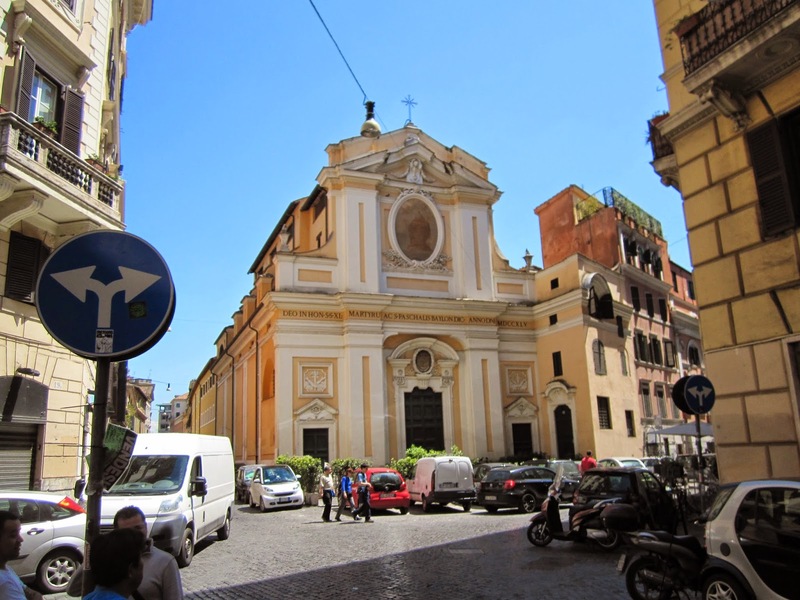 The facade of Santa Maria della Pace was designed by Pietro da Cortona and built in 1656-61. This was part of a rebuilding that was completed in 1667. The church was originally built in the 1480s to a design which has been ascribed to Baccio Pontelli. It replaced a previous church from the middle ages, named Sant'Andrea de Aquarizariis. Sant'Andrea della Valle was built for the Theatines in 1591-1650. Work was interrupted between 1603 and 1608, after which Carlo Maderno became the main architect. The facade was added in 1655-65 to revised version of Maderno's design by Carlo Rainaldi. Santi Luca e Martina was completed in 1664 to designs by Pietro da Cortona after almost thirty years of construction. It replaced a previous church on this site from the 6th or 7th centuries. Santa Maria in Campitelli was built in 1659-67 to a design by Carlo Rainaldi. The icon inside was believed to have saved the city from plague in 1656. This belief led to the decision to build a new church even though the previous one had been consecrated as late as 1648. The facade of Sant'Agnese in Agone was completed in 1672. Originally designed by Girolamo and Carlo Rainaldi, Francesco Borromini took over in 1653, and further modifications were made to his design by Gianlorenzo Bernini and Carlo Rainaldi after Borromini resigned in 1657. A previous church on the site was consecrated in 1123. Sant'Andrea al Quirinale was built in 1658-78 to designs by Gianlorenzo Bernini. The church plan is elliptical. The facade was only added after the death of Pope Alexander VII, due to his insistence that the front should be screened off from the street by a wall. Sant'Andrea al Quirinale replaced a previous church of unknown origins called Sant'Andrea in Monte Cavallo, rebuilt by the Jesuits in 1568. San Carlo alle Quattro Fontane was begun by Francesco Borromini in 1638 but the project stalled and work on the facade only started in 1665. The architect committed suicide two years later and work was continued by his nephew. The church was finally completed in 1682. The fountains referred to in the name of the church predates it and were built in 1593. Santa Maria in Montesanto and Santa Maria dei Miracoli were originally designed by Carlo Rainaldi. Work started in 1662 but was interrupted after the death of Pope Alexander VII in 1667. Work resumed on Montesanto in 1671 under the direction of Carlo Fontana and the church was completed in 1673. Rainaldi continued work on Santa Maria dei Miracoli in 1675-77 but it was again left to Fontana to complete it, which he did in 1678. The facade of San Francesco a Ripa was completed in 1689 to a design by Mattia de Rossi. This was part of a rebuilding project of a church from the 13th century. 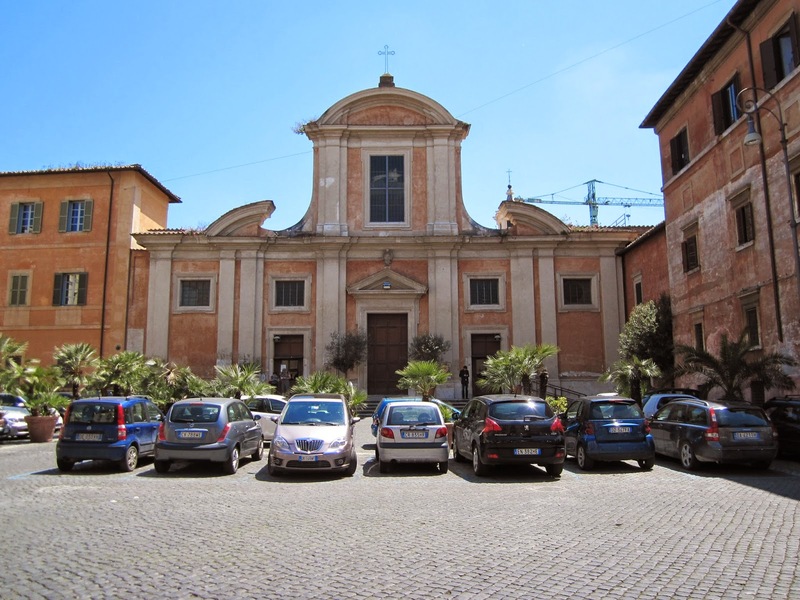 The present facade of Santa Cecilia in Trastevere was designed in 1725 by Ferdinando Fuga, but the portico is much older and contains ancient Roman columns erected on this site in the 12th century. The balustrade on top and was added by Fuga. The bell tower was built in 1140 and the fabric of the church behind the facade is, despite several re-designs, mostly from the 9th century. The first church on the site was probably built in the 5th century though the legend of Santa Cecilia dates it to the 3rd. The facade of La Maddalena, or Santa Maria Maddalena in Campo Marzio to give its full title, was completed in 1735. The main body of the church was built in 1669-98 by architects Carlo Fontana and Carlo Quadri. The facade was probably designed by either Giuseppe Sardi or Manuel Rodriguez Dos Santos. It is regarded as the only true rococo facade in Rome. There has been a church on this location since 1586. San Giovanni in Laterano is named 'the mother of all churches' and is the cathedral of Rome. It has been the seat of the Roman bishop since 312. The facade was added in 1736 and was designed by Alessandro Galilei. The building has been destroyed in earthquakes and fires and the present structure is mostly the result of restorations in the 16th and 17th centuries. The facade of Santa Maria Maggiore is a screen designed by Ferdinando Fuga and was added in 1743. It obscures an earlier facade from the 12th century. The church is actually from the 5th century, but has been restored, repaired after earthquakes and redecorated at various stages in time. The bell tower is from the 14th century. The palatial wings on either side of the facade were added in 1605 to a design by Flaminio Ponzio (right) and in 1743 when Fuga copied this design to maintain symmetry (left). Santa Croce in Gerusalemme was rebuilt in 1741-44 by architects Domenico Gregorini and Pietro Passalacqua while the bell tower was built during a previous rebuilding in 1144-45. but some of the external walls are from the original church, which may have been built as early as 330. The first documentary evidence of the church's existence is from 501. Santa Croce is one of the seven pilgrimage churches of Rome. The facade of Santi Quaranti Martiri e San Pasquale Baylon in Trastevere was built in 1747 to a design by Giuseppe Sardi. A previous church was built in the early middle ages and restored in 1608. The new 18th century church was built for a reform movement of Franciscan friars. The facade of Santa Maria in Aquiro was added in 1774 by Pietro Camporese the elder. The building of the rest of the church mainly took place between 1588 and 1620, with Francesco Capriano and Carlo Maderno among the architects. This work replaced a previous church, most probably built in the 5th century. The facade is mostly in brick with details in white travertine. The bell towers are placed over the external chapels on either side of the church aisles. The first church on the site of San Salvatore in Lauro was built in the 12th century. It was rebuilt around 1450, destroyed in a fire in 1591 and rebuilt again in 1594. The interior was only completed in 1734 and the facade was added in 1857-62 to designs by Camillo Guglielmetti. It is the national church in Rome for inhabitants of the Marche region in Italy.